Why Do We Need a Soybean Nitrogen Credit? In a corn-soybean rotation, the corn will need less nitrogen (N) following the nitrogen fixing legumes than in a continuous corn operation. Thus, a nitrogen “credit” is applied to manage N properly. Most people account for soybean credits when making fertilizer decisions, but often assume the extra nitrogen is coming from the soybeans themselves. The real reason is a bit more complicated and involves several factors including soil nitrogen availability, residue amount, and microorganism preferences. Soybeans do not actually add nitrogen to the soil. As an example, imagine a 60-bushel soybean crop, which needs more than 300 lbs/acre of N. The crop can fix enough nitrogen to supply half of that. At the same time, that crop would likely be removing around 205 lbs/acre N with the beans, which have a relatively high nitrogen content due to the protein content in the seed. In this example, at best, that soil system has around 25 fewer pounds after harvest than it did at planting. This does not mean, however, that the following crop is now short 25 pounds of nitrogen. What matters more than the overall decline in soil nitrogen under soybeans is the availability of the remaining soil nitrogen to the following year's crop- which depends on crop residue. 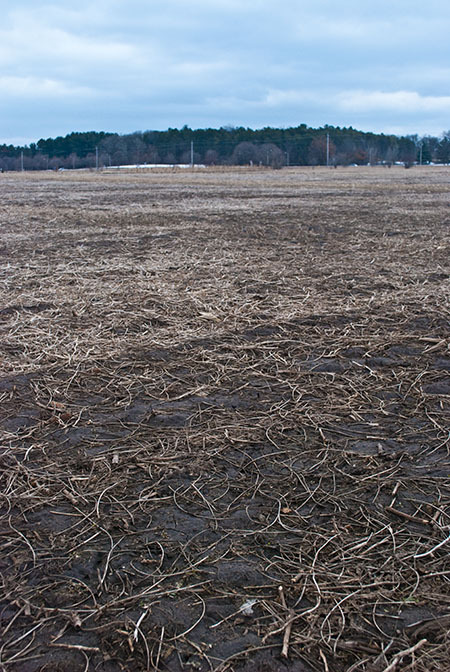 After harvest, soybeans leave less residue on the field than corn. This residue acts like insulation or a blanket for the soil. 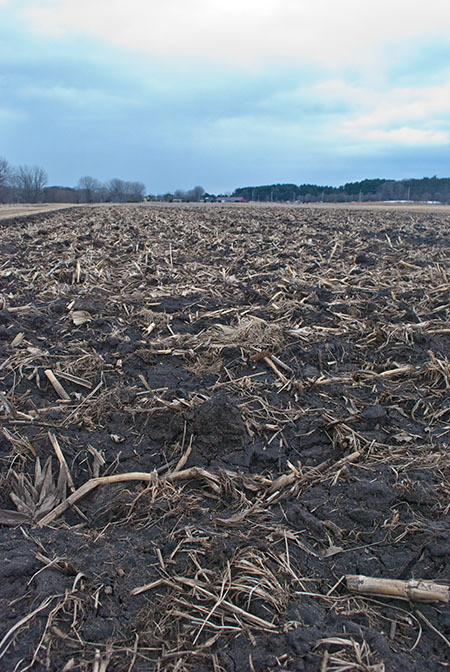 The more residue there is, the more protected the soil is from changes in air temperature and moisture. Generally, a field previously in soybean production will warm up quicker in the spring than a field previously in corn production, where the soil can stay relatively cool and wet. Warmer soils in the spring help soil microorganisms “wake up” earlier in the year and allow them to break down soil organic matter longer. The act of breaking down this organic matter releases more nitrate and ammonium, nitrogen forms which the young corn plants can use. This residue amount/warm up relationship may explain part of the nitrogen credit observed in corn-soybean rotations—but the chemical composition of the residue itself also must be examined. The microorganisms that decompose plant residue need both nitrogen and carbon for their growth, in specific proportions. Most often, that ratio is around 25 parts carbon to one part nitrogen. If they cannot find the nitrogen they need in the residue they are decomposing, they will pull it from other sources nearby, typically from the soil organic matter. Soybean residue has a carbon-to-nitrogen ratio generally between 20:1 and 40:1. This means that microorganisms decomposing soybean residue will not pull much, if any, nitrogen out of the soil. There may be nitrate left over after decomposition, which can be subject to loss depending on the soil environment and the presence of plant roots. In contrast to soybean, corn's carbon-to-nitrogen ratio is higher, around 60:1. Microorganisms need to work extra hard to decompose the residue, which means nitrogen can be pulled from the surrounding soil as well. Plant roots cannot compete against these hungry microorganisms with high carbon residue, so bacteria instead of the crop sop up any nitrate released. This nitrogen is not gone, but temporarily held within the microorganisms for several weeks. This nitrogen process is called immobilization. After the organisms die, available nitrogen is re-released back into the soil, where it can rejoin the soil organic matter, be lost, or be taken in by the plant. While we cannot attribute a particular amount of the nitrogen credit to any of these specific factors, we can confidently say there is need for a credit. According to the research, corn after beans requires 33-42 lbs less nitrogen/acre than continuous corn. This disparity in N needs remains true even with high-yielding soybeans, because it's based on soil nitrogen conditions and residue decomposition rather than the amount of N removed with soybeans. I have heard this before. If so, is it true that the same concept should apply to other low residue crops going to corn, like sunflower or dry beans? Theoretically, but a few caveats. It is important to note that sunflowers cannot fix nitrogen through bacteria such as edible beans or soy. At the same time, percent N in soybean grain is around 6.5% while in an oilseed crop such as sunflower it is about 3.1% (according to the USDA). So this might mean sunflower uptakes less nitrogen than soybeans on a per acre basis. As you can see, there are many moving parts here and more research in other rotations aside from corn/soy is needed.